Wow. 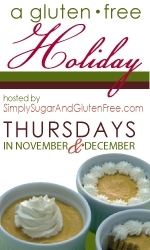 Week 4 of the Gluten-Free Holiday Event, hosted by Simply Sugar and Gluten-Free, is already here. How can that be? Week 3 – Alta shared her Edible Gifts of Good Taste with her Gluten-Free Chipotle Maple Mixed Nuts. Hallie, over at Daily Bites, is focusing on Holiday Entrees and Sides with her beautiful Butternut Squash and Cabbage Salad. Make sure to go and link up a favorite savory holiday dish, either in the linky or in the comments. 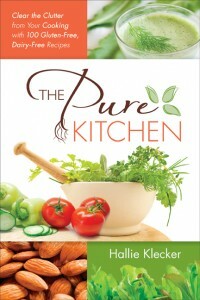 This will enter you to win a copy of Hallie’s amazing cookbook, The Pure Kitchen. It is one of my favorites and it soon could earn a spot on your counter. Now, is it just me or do you too feel like time is passing by so quickly these days? I am really focusing on staying in the moment and enjoying each memory we are creating this season. My husband and the boys have already donned the outside of our home in so many lights that Clark Griswold would be jealous (after all, ours are set to music 😉 ). We are taking part in all of our favorite family holiday traditions: hot cocoa and cider by the fire, a different Christmas story book each night, Christmas music playing all afternoon, and the mad dash each morning to find where our special little Elf (on the Shelf) is hiding. We named our Elf Canyon years ago and he never disappoints in reappearing each year. He is certainly a mischievous and antics-filled little fellow. And last night he made a dashing debut into our home… and then somehow got stuck in the air vent uptake. Hopefully he will manage to get himself out of this pickle tonight as he has an important job to do. He has to get back to the North Pole to report to Santa on who has been naughty or nice in our home. I know one thing for sure. Mom has been nothing but nice this year. It is great that December marks the month that my boys are sweet little angels, not wanting to upset Santa in any way. It is just too bad they do not have elves for every other month of the year. How about a Valentine Elf? Or a St. Patty’s Day Elf? Perhaps a Patriotic Elf for the 4th of July? Ooh. And what about a Birthday Elf, for the month before their birthday? Okay, enough dreaming. I want to share a recipe that I love making during this time of year. The boys in this house, old and young alike, love them. 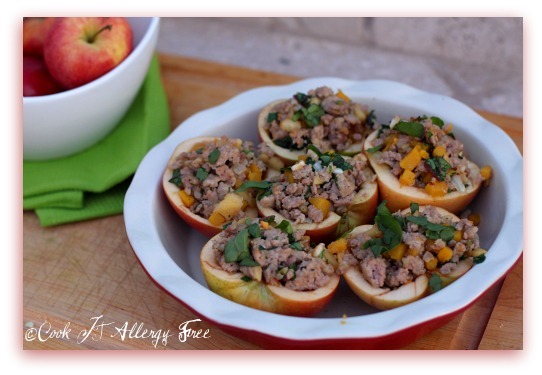 These Savory Baked Apples are Gluten-free, Dairy-free, Egg-free, Nut-free, Soy-free, Corn-free, and easily Vegan. They are a huge hit around here and are packed with healthy ingredients that no one even notices. You can play around with the ingredients in the stuffing. Omit the Italian sausage for a Vegan version. Play with the herbs. Kick it up with some spice. Anything goes really. But below is our favorite combination of goodies. 1. Preheat oven to 375 degrees. Cut apples in half. Then, using a spoon, carefully scoop out center core and discard. Then scoop flesh from inside of apple skin leaving a 1/4 inch shell around the edge to keep the shape. Reserve the apple flesh. Rub edges of apple with the halved lemon to prevent too much browning. 2. Finely dice reserved apple flesh. Toss apple pieces with about 2 tsp of lemon juice to prevent too much browning. 3. Sautee sausage over medium heat until it begins to brown, about 3 – 5 minutes. Add in diced onion and squash pieces and cook for 3 – 5 minutes more. Add in apples and herbs and cook for 1 minute more. 4. Remove pan from heat and add in greens, salt, and pepper. 5. Place prepared apple halves in 8 x 8 baking dish. Fill each apple half with about 1/4 cup of the sausage mixture. Add apple juice to the bottom of the pan, around the apples. Place pan in oven and bake for 25-30 minutes. Garnish with additional fresh herbs if desired. 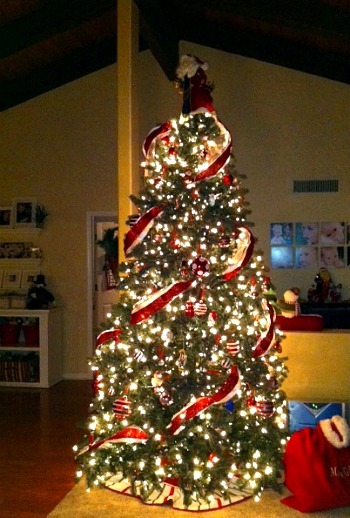 Your tree is beautiful! I can’t wait to start mine on Friday after work. I’m really looking forward to this holiday season! The apples are such a great idea! My boys would definitely love them! Love the mix of flavors you have going on. I bet they are delicious! Your tree IS gorgeous. And the rest of your decorations – so festive. 🙂 I’ve never heard of this “elf” thing until a friend of mine started posting stuff on Facebook about their elf – and now I find that you have one too! What a fun tradition. I love the stuffed apples too. I could really see these being made soon at our house! 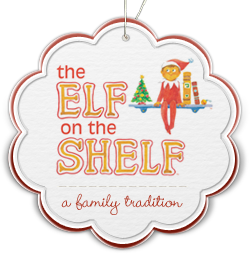 Alta, the elf has turned out to be a really fun tradition and a great way to get the kids to be good all December long! 😉 It has definitely become quite popular – seems like most people we know have one now! Oddly, mom did the elf trick w/ us when we were growing up, so I am using those same elves, which look just like the “new” version from Elf on a Shelf. We had 2, one for me, one for my brother. I have both now, used them for both my girls all these years. Gigi, I just love that your Mom was so on the ball to have elves too! And even cooler that you are using the same ones with your girls! I love traditions like that. Our elf on a shelf is named “Nicky” and he showed up yesterday too, LOL! I love this idea and I’m all for a Valentine’s Elf, a 4th of July elf…how about a Mother’s Day elf??? I really wish I lived near Kurt (and you!) this time of year, we would definitely blow the city’s electrical grid, LOL! And the apples look beautiful, those babies are going on my menu plan next week for sure! Tell “Nicky” that “Canyon” says Hi, Heidi! I am loving the idea of a Mother’s Day Elf. And I can only imagine the trouble that you and Kurt would get into if you two were working on Christmas light ideas together. Oye! You guys would have people lined up for miles to come see what you conjured up! I can’t believe your house is already decorated! I am soooo behind. . . . Well, love the idea of those apples, anyway! I am going to try them with my homemade soy-free veggie “meat” crumbles (bet my hubby won’t know the difference). 😉 Mmmm! 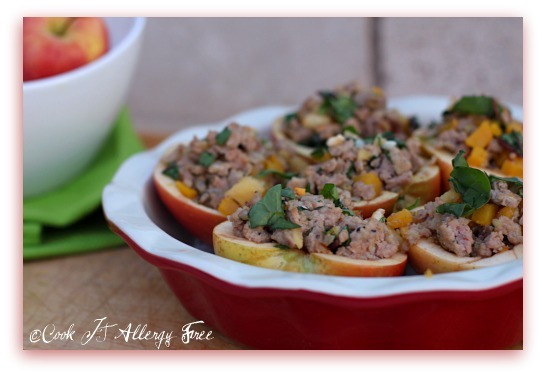 And I bet with your veggie “meat” these would be amazing! Your hubby would never know. Kim, these sound delicious – wish I had one for lunch right about now! THanks Cara! They are super easy to whip up! You are too funny Kim! I need to get my hands on an elf, I’ve sent my sister on a mission tomorrow! These baked apples sound so awesome. I can’t wait to try a vegan version, you’ve got my mind working so I can try this! And the vegan version of this is just as yummy as well! I just load it up with the squash and greens! Hmmm, I can just smell how good these stuffed apples must be. I’ve seen that Elf on the Shelf around – cute idea! OK, so did you upholster those chairs for Christmas too? Looking at all that you have going on for the Holidays I would not be surprised 🙂 Your house looks lovely, the traditions sound fabulous and those apples are very unexpected – I had never though of savory stuffed apples before – kind of genius! Carol, you crack me up! 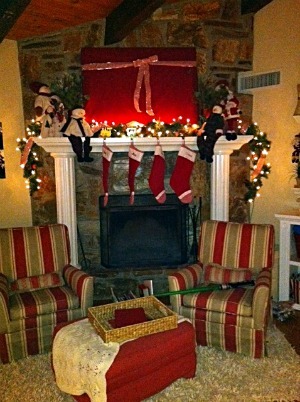 The chairs just happen to match my holiday decor – trust me, I am not that organized. LOL And these apples are an easy way for my kids to eat all of the goodies in it. When I put the same stuff in an acorn squash they were not nearly as enamored with them. LOL The apple medium made a big difference! Alisa, forget the fact that we are the same age. I would adopt you and Tony in a heartbeat. Seriously. How much fun would we have together. baking like crazy?!? One of these years, you need to come at this time of year! Oh my, IntolerantChef! You are ambitious! 3 trees! I love it. I can only imagine how festive it must look in your home! Love the elf! Cute and a sweet tradition. Thanks Karen! That elf definitely makes it exciting for the boys!